We are involved in providing an alluring range of Navy Awnings to our clients. These products are manufactured using finest raw material and latest machinery. Our range is extensively used in Navy to serve various storage solutions for keeping papers, instruments and important documents. Moreover, these products are available in various shapes, designs and sizes to suit the specific requirements of our clients. Backed by ten decades of rich experience, we are known as a renowned manufacturer, supplier and exporter of Textiles and Tarpaulins. 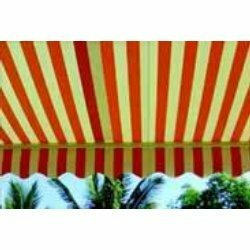 Our product range comprises Specialty Fabrics, Roofs And Canopies, Leather Look Fabrics, Bonded Fabrics, Automobile Accessories, PVC Coated Covers / Tarpaulins, Sports Goods and Defense. These products are manufactured using superior quality fabric and other raw material that are sourced from certified market vendors. Our range is extensively used in defense sectors, commercial, automobile, sports and shipping industries to serve varied applications. These products are known for their durability, tear-resistance and longer functional life. Furthermore, our products are available in customized form as per the specific needs & requirements of the clients. These products are fabricated in compliance with international standards and norms. Owing to our expertise in this domain, we also offer clients with process capabilities like Calendar Coating, Solution Coating, Powder Coating, Dot Coating, Wet Laminating, Printing, Embossing, Finishing and many more. All the activities of our organization are carried out under the name "Khimji Velji & Company". The professionals of our organization are engaged in manufacturing an exclusive range of quality products for our clients. They use high-end technology and sophisticated machinery to fabricate our products. Moreover, our clients can make payments via cash, cheque and DD as per their convenience. Owing to the quality factors and ethical business practices, we have been awarded with an ISO 9001 certification. We have developed a wide distribution network in the parts of Indian Subcontinent, which has helped us in reaching our end users easily.